Mayan Egyptian Connection Spans Atlantic Ocean. Who were the Mayans? The Maya developed their first civilization in the Preclassic period. Scholars continue to discuss when this era of Maya civilization began. Discoveries of Maya occupation at Cuello, Belize have been carbon dated to around 2600 BC. The civilization still had great endurance. Look back some 3,000 years. Mayan Tikal was around from 250 to 700 AD. At its height during the Late Classic, the Tikal city polity had expanded to have a population of well over 100,000. Part of the courtyard at Tikal. We have no written evidence of connection between the two cultures and their countries. But, we do have similarity by measurement. Many are too fixated on proof by written record. They forget that numbers and letters once shared the same symbol. This practice of using the same symbol for both is called gematria- a Greek word. Only our modern languages (except Hebrew) have separate symbols for both. In effect, when you made a measurement, you also could imply a (1) A word. (2) A phrase. (3) An entire sentence. (4) Even a larger unit of writing translated into numbers. A surviving Mayan great court is at Tikal. It outlines a rectangle. East to West is 400 feet in length. North to South is 250 feet in width. 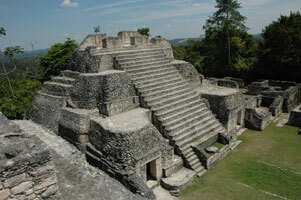 The courtyard is flanked by platforms, large temples and pyramids. The ratio of the length to the width of the Tikal courtyard is 8:5. Note 400/250 = 8/5 = 1.6. Compare this to the Great Pyramid of Egypt. One side of the square base is smaller Egyptian 440 cubits of 1.71818…feet. Its truncated height is 275 of the same sized cubits. 440÷275 = 8/5 = 1.6. Comparing the Great Pyramid’s Dates to the Mayan first civilization in the Preclassic period. Leonardo Bonacci who was born 600 years before Beethoven. The Fibonacci series, named after him. is colored in red. Beethoven used the Fibonacci numbers in composing his fifth symphony. In the internal link underneath, I relate Fibonacci numbers to ancient number squares. I don’t know that Fibonacci ever made the connection? Behind Leonardo Bonacci’s back, the highest red number is 55. Each new number is the sum of the preceding two. Number 34 precedes 55. So, let’s continue the series: 34 + 55 = 89. Next, 55 + 89 = 144. Next 89 + 144 = 233 (the length of Beethoven’s opening section). Next 144 + 233 = 377 (which the length of Beethoven’s development section). Beethoven, being the brilliant genius that he was, knew exactly what he was doing. Note in red numbers. Number five is the 1st separated number. It is not consecutive. Almost every composer uses phrases in 4 bars. The genius of Beethoven made the opening phrase 5 bars long on purpose. He knew what he was doing! Five bar opening phrases of Beethoven’s 5th Symphony. The Egyptian Mayan connection of the 8 to five ratio is found with Beethoven. Of course, in this symphony Beethoven uses many phrases also use 8 bar phrases. When we listen to his 5th symphony it sounds natural. Can you imagine how he must have struggled to make the bar length come out right? Leonard Bernstein says of Beethoven and the 1st movement in The Joy of Music: “he will give away his life just to make sure that one note follows another inevitably.” In conclusion, I think that in addition to an even greater appreciation of Beethoven, we have graphic proof the relationship between music, numbers and architecture in this post: The Mayan Egyptian Connection and even more. This is why music lessons, theory and composition increase aptitude for mathematics.